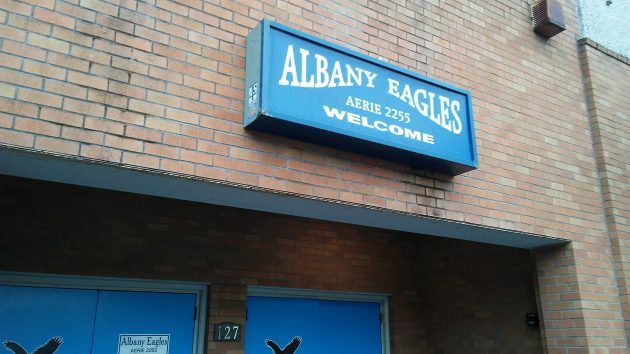 If the Albany Eagles lodge comes up for sale, the city’s urban renewal agency would be interested. That’s the gist of a discussion among members of the Central Albany Revitalization Area advisory board Wednesday night. The board voted to authorize urban renewal manager Seth Sherry to explore with the Eagles whether the building is for sale, and if so, to see if it would be offered to CARA first. This essentially is the same decision the CARA board took in September 2017, when the topic last came up. At the time, members of the lodge strongly protested that they had not decided to sell the property and any public discussion about it was out of order. On Wednesday, Mayor Sharon Konopa stressed that it wasn’t the city pushing the idea, but that CARA had been approached about it by a real estate listing agent. The agent told me that an appraisal of the property had been ordered and was expected to be done by the first of the month. Any decision to put the lodge building on the market would probably be up to the Eagles’ national headquarters. The agent referred me to an Eagles’ board member for clarification, but my call to that person was not returned in time for this story. The Eagles’ riverfront property at the southeast corner of Water Avenue and Broadalbin Street is shown on the city’s urban renewal plans as a key site. In 2011, a refinement of the plans suggested it be developed for parking. But on Wednesday there was talk among the CARA board about other uses that would be more helpful to the city’s economy. A riverfront hotel was mentioned, but at this point it is all speculation. A hotel! OMG! Just what we don’t need. But, a parking lot, if public and city owned, would pay no taxes, and CARA doesn’t cotton to that. Of course, Sharon Konopa and CARA are “not” angling for the Eagles to sell…and, BTW. I have a bridge to sell you! It is the real estate agent who is being pushy. Everyone at the city is lily white, as the old saying goes. How would the real estate agent know to approach CARA if it wasn’t known that CARA has an eye on the property? The building has no windows because in the 1950s it was still the custom for men to be able to drink alcohol in an establishment where wives passing by could not see in. Wow. Why attack the mayor? She was voted in by the majority of the voters in town. Boutique hôtel sounds nice to me. Let’s grow a little and support a vital downtown! great location – hope something really nice for Albany ends up there eventually. Why not a hotel? High-end boutique style that will be complete with an underground parking garage for all to use! Chortle as you may but I dream big. Finally it could be an entity paying taxes and not free-loading while attracting out-of-towners to take in the historic homes of Albany, River Rhythms in the summer and shopping in the neighboring boutique shops. It could be something “bigly” if done right. Raze that hall ! A multi-use that included parking, office or hotel, and ground floor retail might provide a boost to downtown, especially given the proximity to the river, Monteith park, and the carousel. The appraisal was most likely being done for insurance purposes. Lots of greed showing here! Aww Geez, if CARA gets in it there’s gonna be more than necessary taxpayers “skimming money” involved! !